Speaking of stuff, my kids were in complete shock this past spring when I bought a small purse from the local thrift store. You see, I already had a purse, so why would I need another one? I’m sure most women reading this would not need an explanation, but in case there is any confusion, my purse is a very colorful pattern, and it just didn’t go with several outfits. Practical Me, for years, has always stuck with plain materials for my pocketbooks, but in recent years I have thrown caution to the wind and added some pizzazz. Of course, I tend to wear solid shirts and pants, so a loud purse wasn’t a big deal. Then, Impractical Me started adding pattern dresses and shirts into my repertoire. I know, crazy. Symptomatic of a mid-life crisis. Plus, my regular purse was large, and sometimes I only wanted to carry a few things. It seems silly to carry a big purse when inside is a wallet, some lip balm, keys and a cell phone. Then my sister and I went down to St. Augustine and I lugged my camera everywhere. My camera is not light. It does fit in my purse, but when traveling I tend to carry around more than a wallet and lip balm, so it was pretty full. I decided that what I really needed was a backpack. We shopped. I looked. I concluded that backpacks for women come in two types: inexpensive but ugly or attractive but way more than I was willing to spend. Keep in mind that the last purse I bought myself was found at a thrift store. 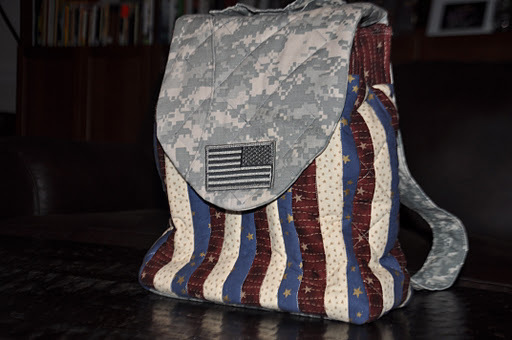 Then I found this backpack pattern online. For free. All it cost me was time. Well, not exactly true. I had to buy super-stiff interfacing and batting. But I bought no fabric or thread for this project, and I had a coupon for the other supplies. Sewing did take up the better part of the weekend, but I love the results. 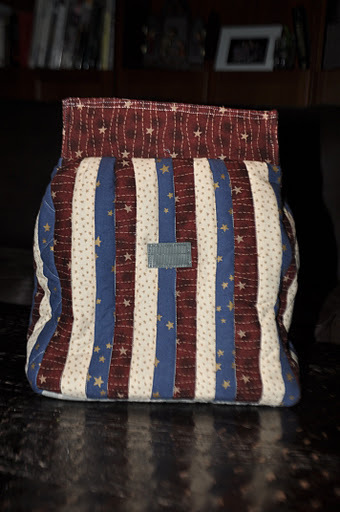 It was my first real quilting project. And it uses a recycled uniform. The flag hides where I stitched velcro to hold the flap closed. I may change that to a magnetic clasp at some point. No rush. The velcro came off a uniform pant pocket. The straps are made from the collars of two uniform blouses. They were the perfect length. I was especially excited to use velcro closure pockets from the legs of the pants for the lining. The big ones on the front and back are designed to hold knee pads (in the uniform – not my backpack). 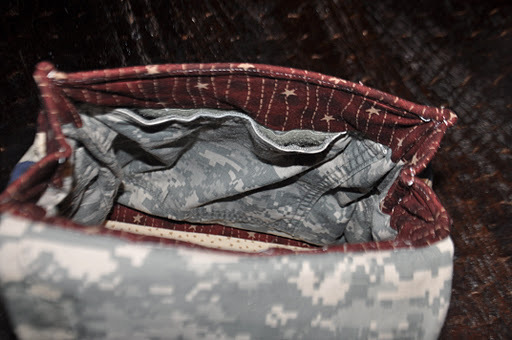 One side pocket is the perfect size to hold sunglasses (in my backpack – and on the uniform). I used the back panel of the pants to make the flap. I included the back pocket which has a button closure. It’s a typical back pants pocket so it’s a good size. I think the top of the backpack is the perfect place to store keys and a cell phone. This flap was probably the second most tedious job to do. I had to pull the pocket aside to do the quilting, then make a slit in the backing to tuck the pocket under the quilting so the pocket wasn’t quilted shut. Then I added some faux-quilting to the top part of the pocket. The stitches aren’t perfectly aligned, but it wasn’t an easy job to do! I’m satisfied, and I know that 85% of the world will never notice. And the other 15% who do will know that it’s not perfect because I made it myself. The last detail is this extra fabric, unaligned-to-anything stitch running in an arc on the side. What is it doing there? Well, that’s the way the pants are made. That fabric is where the seat of the pants begins to curve around (this would have been the right back pocket). My husband asked me if I was going to remove the fabric. 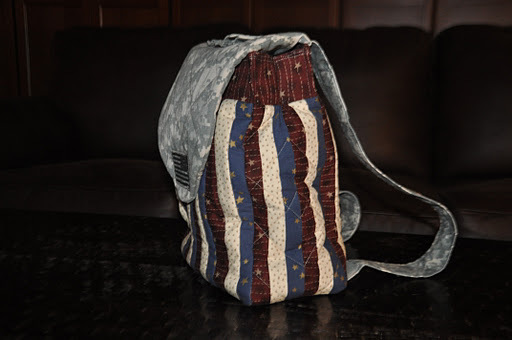 I could have, but then it wouldn’t have this quirky extra-fabric-unaligned-stitching-unique-to-my-bag-because-it’s-made-from-a- real-uniform look. It’s art, I told him. 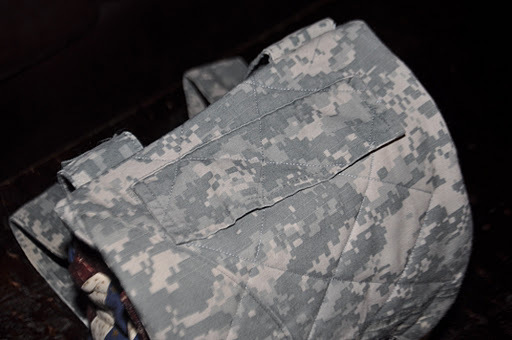 I also told him if I hadn’t wanted that stitch there I could have just used the ACU fabric I bought in a bolt that’s still lying around my house. As I sewed this weekend, I vaguely paid attention to the hours it took me and I decided that if I were to make this for someone else I wouldn’t do it for less than $80. It just took that much time. I’d do it for me; I’d do simpler patterns for my kids (the most tedious job was the inch wide stripes that I had to sew and iron flat…if I did wider stripes, it would be easier and less work). But I won’t be cranking these out for general sale. But I like the results so well that I really think I’ll search the online patterns before I ever buy another purse again. ← How much more stuff do we need? Love it! Especially love the fact that you took something that you had (pants) and made it into something you wanted! Fantastic – great imagination, great fabrics – can't wait to see it! What a great way to get all those compartments you need to keep things organized. A simpler version using the fabric instead of the pants would be a hit. What if you just made long channels of the red, white, & blue & cut them across at the length you need? Almost like an assembly line. Clotilde has purse patterns. Annie's attic, Mary Maxim, & Herrschner's may have them also – I'll take a look. I'm tempted myself,but know I really don't have the time. Really cute! The only thing is that the flying backwards flag is making me twitch. I bought a book of really cute tote bag, messenger bag, etc patterns. Then I remembered that I don't really like to sew. Mom, I did make long channels of fabric and then cut to size. Still tedious, especially the ironing. Would much rather do the pattern with 3″ strips. Lorri, fortunately, I carry over my right shoulder, mainly, so the blue field is leading the way, as required. 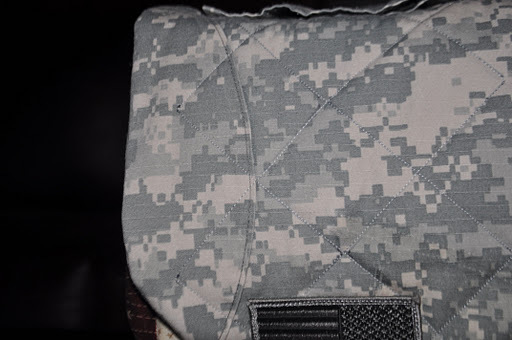 I love the fabrics you picked, and how awesome that you could recycle a uniform.